Caution sign yellow-gold is out of my life FOR-EVER! My dining room, an awesome oval room (OVAL! no corners), was painted bright caution sign yellow gold with white trim and sky blue accents. In any other room I could have maybe probably handled the blaring brightness, but not in my dining room. The prior owner had to paint the room something other than pale pink but why caution sign yellow-gold, I will never know as the color combination was so incredibly out of line with the rest of the colors chosen for the house. 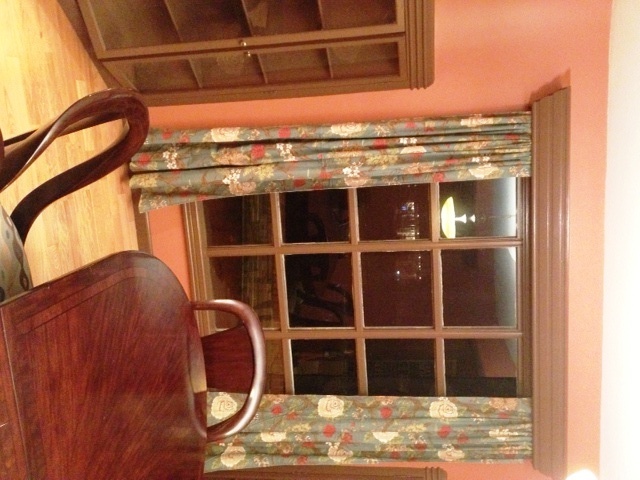 This is the before paint, trim and accent color inside the cabinet, highlighted by the curtain and vase. We bought the house with some rooms furnished. The dining room was one of the furnished rooms. 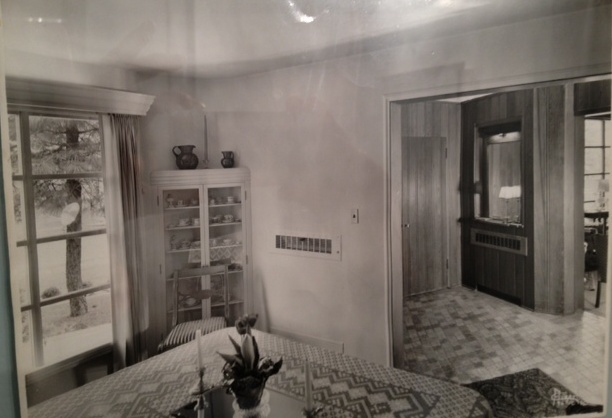 In addition to the garish paint, our senses were overwhelmed with the rug and chair fabric. You may love the combination, for me, it was painful sensory overload. We based our paint selection off the tile, that a local quarry supplied in the 1940’s, similar to the original owners. 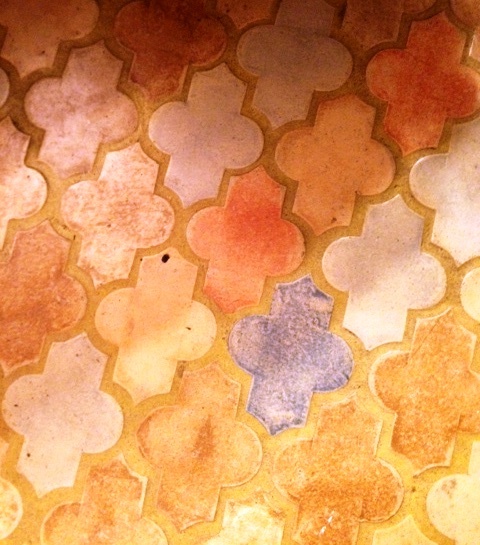 Instead of going with pink, we focused on the more salmon or coral color found in the tiles. We also had to take into consideration the Brazilian rosewood that panels the walls in the foyer as it transitions into the dining room. My husband is a master painter. I taped the whole room, he cut in the tricky parts, around the cabinet details, and we both rolled. I am not a professional photographer so the photos do not do justice. The brown paint draws out the dark flecks in the wood floors and the rose brings out the warm tones. Our wine glasses will go in the cabinet on the left and our china will go in the cabinet on the right in another week, giving the cabinet paint more time to dry. We decided against a rug for now. 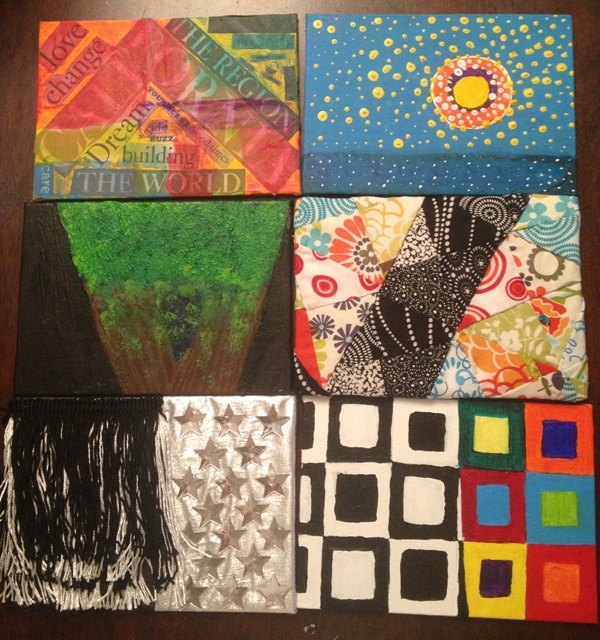 We still have artwork to decide on and hang. The seat cushions match well enough that I won’t consider changing them out for at least a year or more. 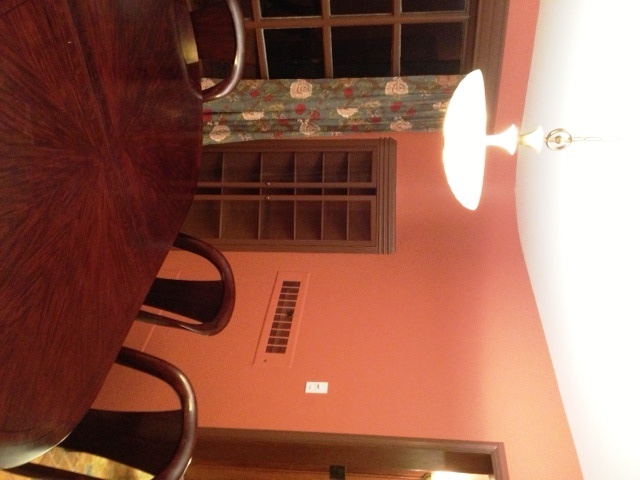 Project dining room is very close to completion and we will make our Thanksgiving deadline. I love our new dining room. I hope you do too. In other news, our middle son told me this afternoon he wanted to start doing more stuff. “Like what?” I asked. “Cooking, horseback riding and blacksmithing to start.” Really? Blacksmithing? Where does he come up with this stuff? “Let’s start with cooking,” I suggested. Tonight he made his first batch of chocolate marshmallow cookies from beginning to end. I only helped put in and take out the pans from the oven on his direction. When we made the decision to sell all of our furniture before we moved from Placentia, CA to Spokane, WA, we knew the time and energy and expense we would incur to make our house whole. As with aging, what we know now, compared to what we knew then are extremely different things. We had a plan before moving. It was a good plan. Bedrooms were assigned, office space planned, everything fit. We had a list of things we needed to buy and a rough cost estimate to budget. Then we arrived and all plans flew out the window. The vibe, feel and flow of the house, with us, our things, plus managing and dealing with all the things that were left in the house wasn’t right, based on our plan. We quickly adapted and modified our plan. Part of the new plan involved creating a 10′ x 18′ space in the garage to house my husband’s man cave, office, and music space. This was our first project and consumed a solid three weeks. No photos yet of this space as now that the space is defined, my husband is still working on the interior design. I’ll post the finished product once complete. While Vince was occupied with his project, I ventured down my own path to furnish the house. For rarely, like next to never, watching TV, I have seen my fair share of DIY design shows. I love DIY projects because you get something awesome for an extreme fraction of the price that you would pay for something new. I found a new couch that I kinda liked, but I couldn’t bring myself to buy it because it wasn’t right. Instead, I bought a beast of a sectional circa 1970, originally from the Leather Center. I found this rounded, overstuffed light blue leather sectional for $200. I showed Vince the picture and he said he liked it as it reminded him of the rounded sectional his family had when he was a kid. I drove over to see it, then called Vince to bring the trailer and pick it up. When Vince saw the sectional, he didn’t say a word but I could tell he was raging mad. He hated it but the deal was done so we loaded the couch onto the trailer. At home with the couch in the living room, I hated the couch too. I didn’t buy it because I thought it looked great. I bought the couch for its potential. With the two rounded sections removed, the two end pieces create an 11 foot long couch which fits the room beautifully. Vince, thinking the couch we picked up was the couch I wanted in as is condition, was relieved to hear my plan for the couch. Vince loves any engineering challenge, so he is tasked with modifying the center wood pieces where the sectional meet to create one piece. My job is everything else. 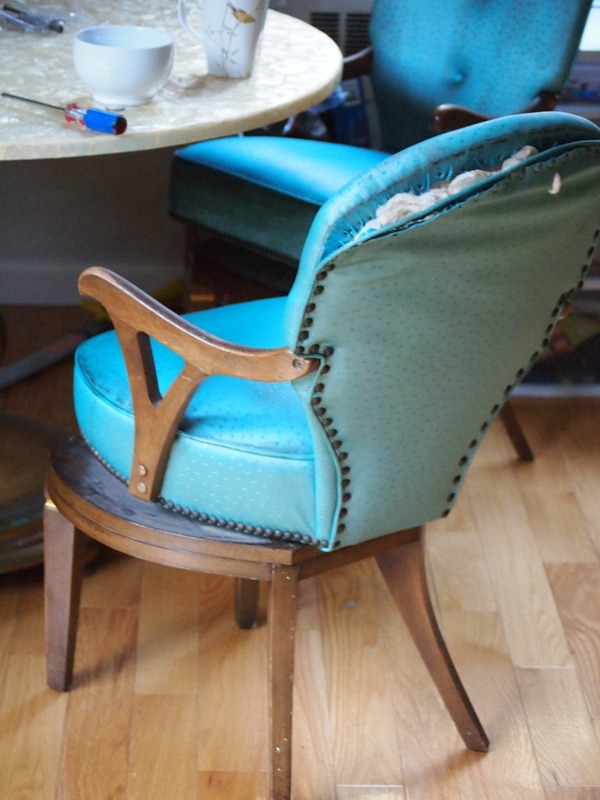 Have you ever upholstered a piece of furniture before? I have upholstered a couch, some stools and patio chair cushions, each time learning as I go, drawing on the issues I had in the previous project. 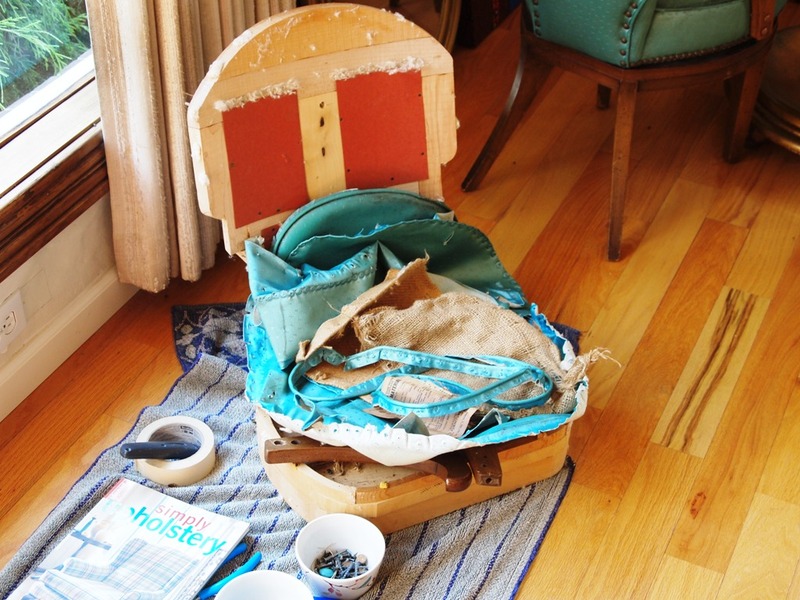 Upholstery is a lot of work, but worth the effort in the end. 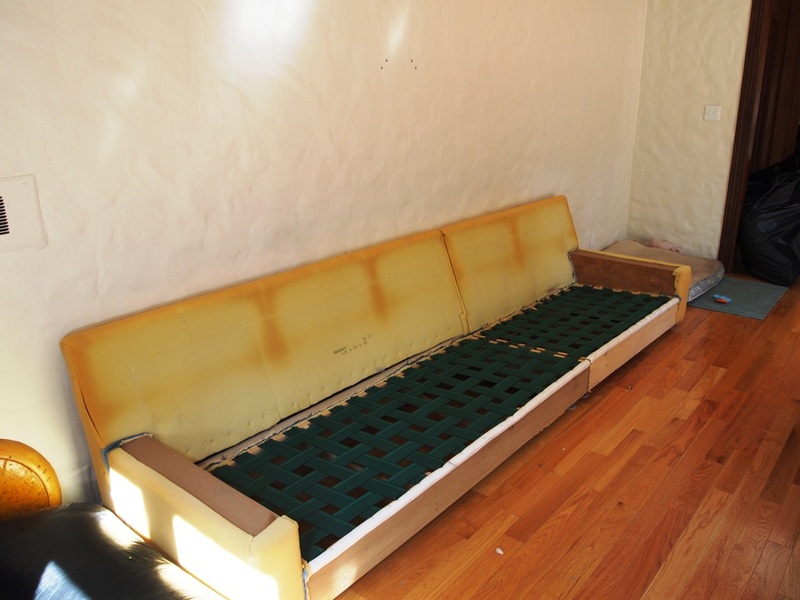 The first is the couch project. I have most of it ripped apart. The next step is removing the arms and finalizing the demolition. Vince will then modify the center pieces so you don’t feel the boards when you sit down. The couch will have 5-6″ legs, and clean lines. We have narrowed down the fabric to 3 choices, all shades of blue. Next is the vintage table and chairs. I tore apart one chair to see how complicated it would be as well as how much yardage I will need for upholstery. Each chair has 178 nail heads in the trim at the base of the chair and around the back. Removing the nail head trim on the back was easy, the trim at the base was painfully difficult. With one chair disassembled, I’m happy I finished uninjured. 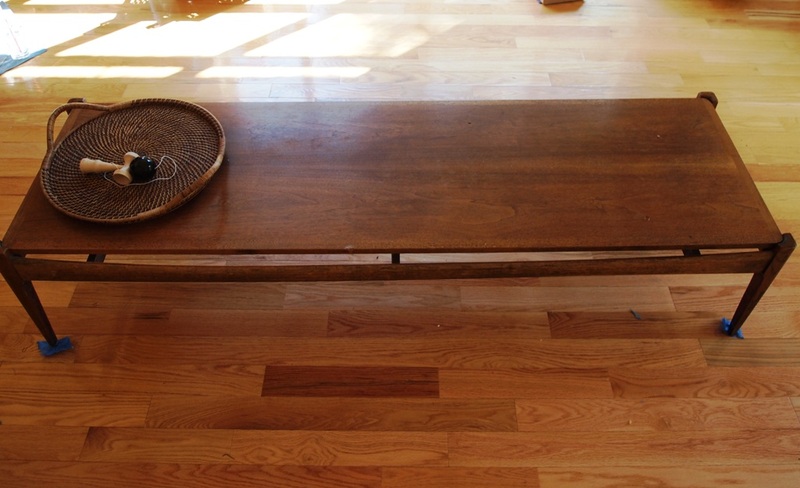 The story behind the table is another craigslist find. I needed a desk, but wanted a table instead of a traditional desk. In Yorba Linda CA, a man listed this table and chairs. I loved it from the moment I saw it posted, even more so in person. When I picked it up, the man selling it told me his family member owned the furniture store in Los Angeles. Eva Gabor, Zsa Zsa’s sister, saw this table and commissioned a full dining table off this sample. Is it true? Who cares, it’s a great story. 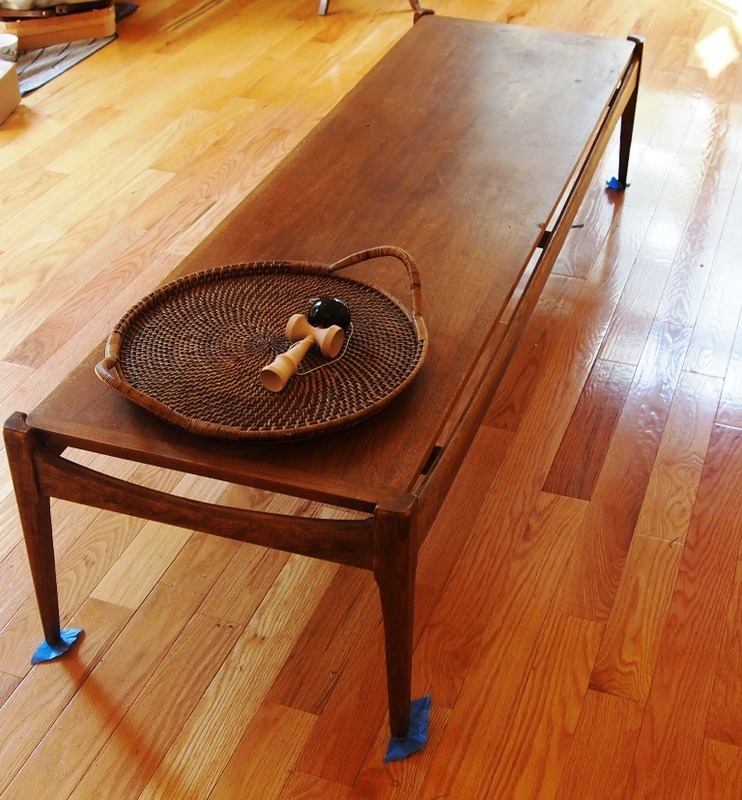 The walnut coffee table measures 71″. I love the mid-century modern style. These photos look pretty good but it needs to be sanded and finished. This was a $100 craigslist score. This clock has been through so many moves but has been stored for at least the past 10 years. This clock was one of the original Pacific Bell clocks that provided the time when, way back in the day, you dialed a number to find out the time. A woman would say, “At the tone the time is….Beep”. Are you old enough to remember calling time? 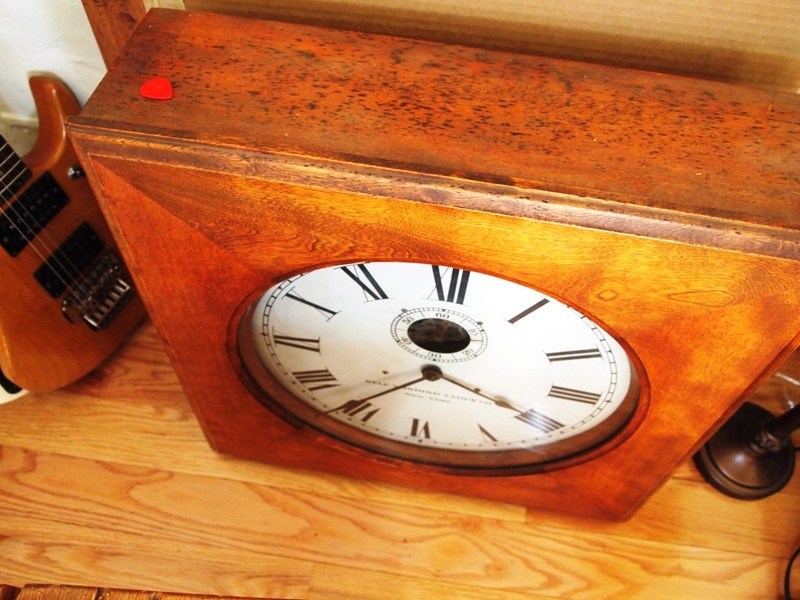 My father-in-law was a linesman for the phone company and recovered this clock from the trash during a modernization remodel. It was painted black and my mother-in-law finished the woodwork. Any time this clock is moved, the inner workings get mangled. This is one project I’ll happily deliver to the clock repairman. I just found one the other day and need to drop off the clock soon. 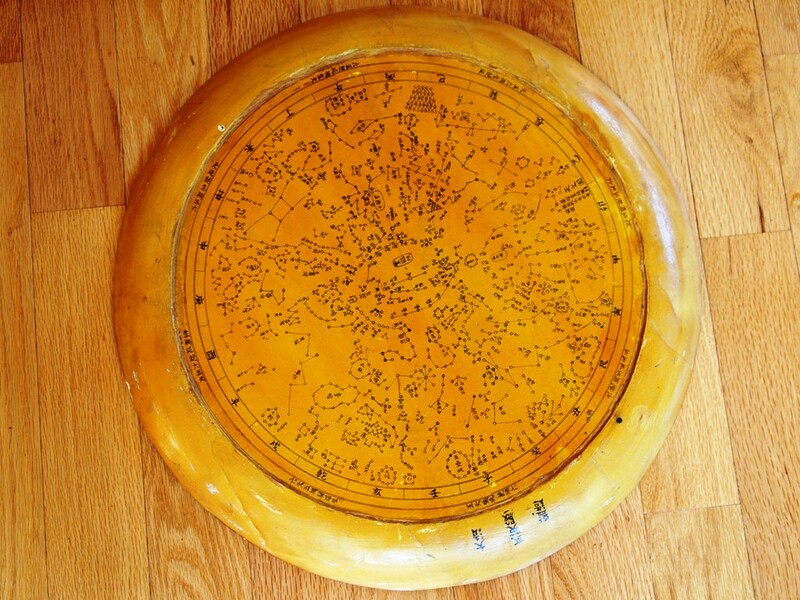 One of the items left by the previous owner was this chinese astrological calendar wheel. It was hanging on the wall in the living room. 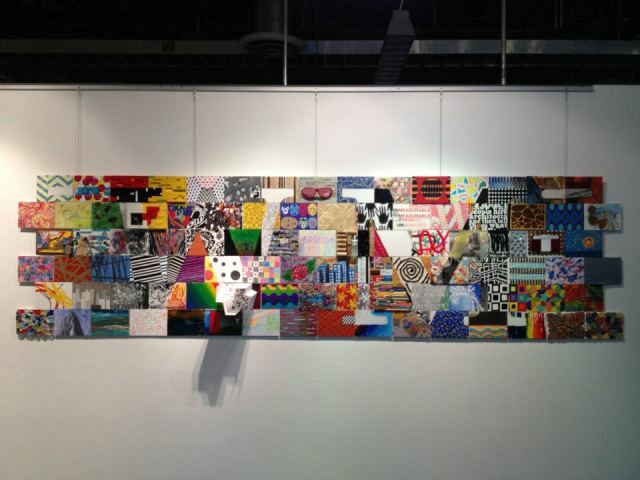 I love the piece, but do not want it as a wall hanging. I’m going to repurpose this piece and create a table by adding some sort of base. The piece is double-sided, but I like this side the best. All of these projects above are for the living room. I also need to change the draperies, make poufs in front of the fireplace and pillows for the beast of a couch once it is complete. The dining room is painted a shocking caution sign yellow. I can’t stand the color. It offends me every day. I can’t wait until the painter arrives, currently scheduled for the week after Labor Day, while the kids are in school. 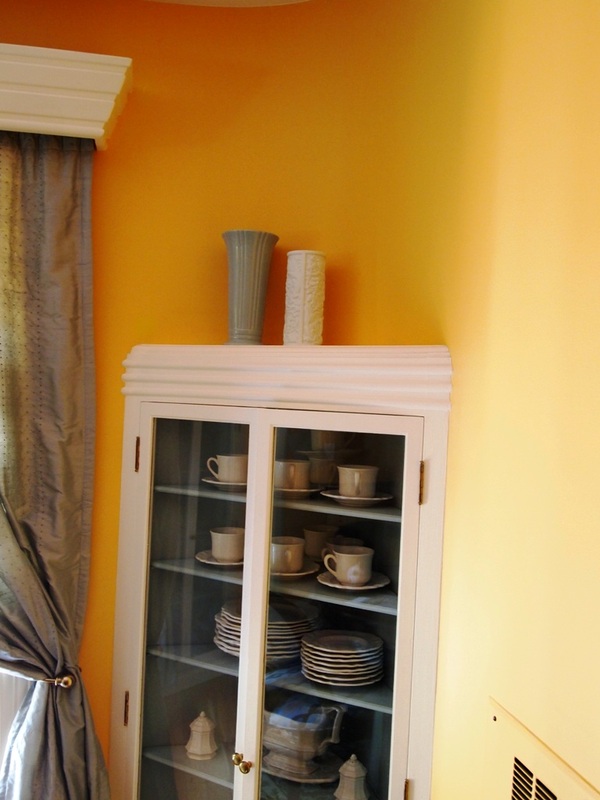 My china looks fantastic in these built in cabinets that flank the window. The dining room is oval which is super cool. But the color!! Ugh! To add to the “Bee” (that’s the name of the paint color), the seat cushions and rug conflict with my brain. 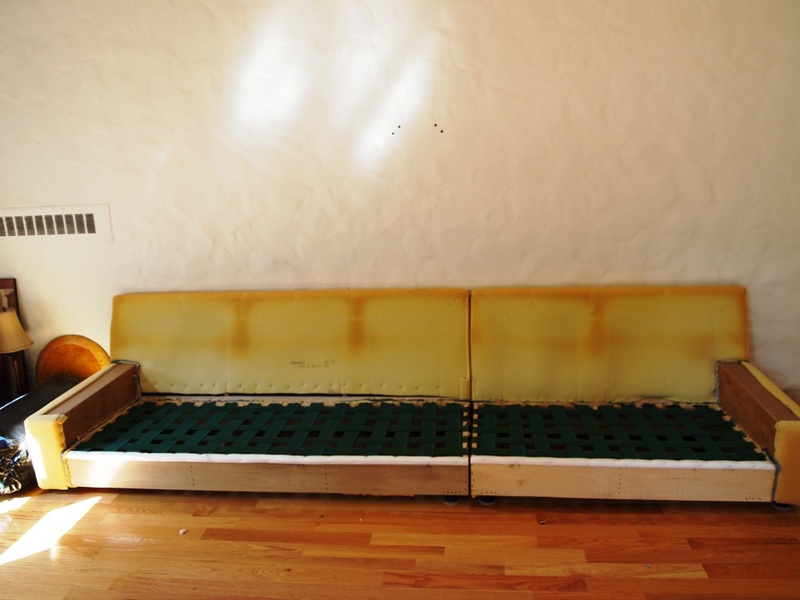 The idea, as I understand, was that the paint is matching the yellow squiggly in the chair upholstery. With this plan, the rug doesn’t work. It may work for you, it hurts me. The dining room table and credenza came with the house. 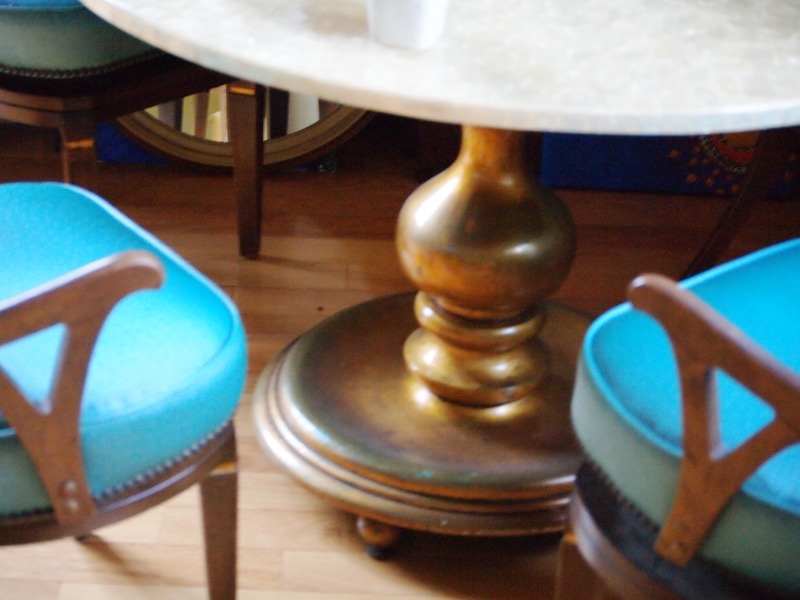 I love the furniture but the color combinations, if you haven’t already gathered, is not my favorite. 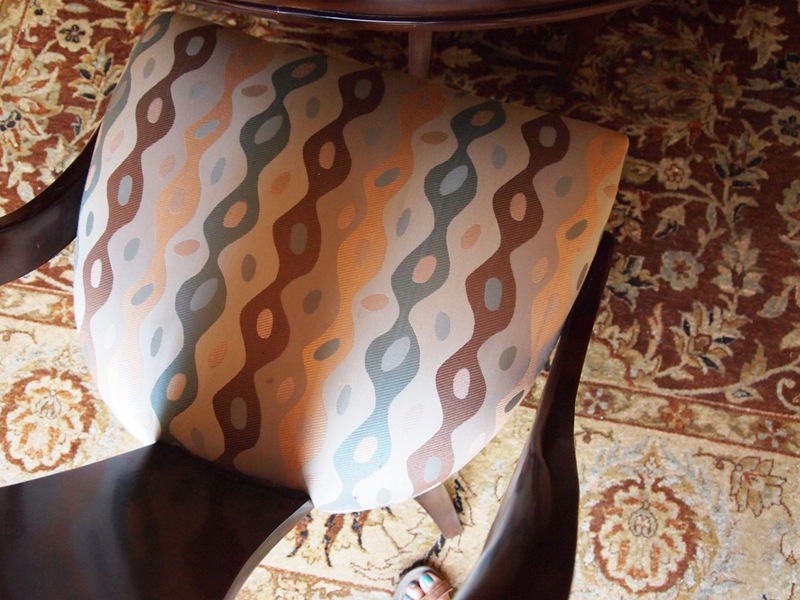 I’m going to change the upholstery fabric on the six chairs, hopefully before Thanksgiving. Moving upstairs, two of the boys share a room. The room used to be a girls room done completely in purple. Purple carpet and purple walls. We pulled up the carpet to find the original hardwoods. Out went the carpet, tack and staples pulled and the plan is to eventually finish the floors. The floors are in good enough shape for now. We have to lower the baseboards and paint, another room slated for the first week of September. These beds are my super score. $57 total (not each) for both bedframes. They were in sad shape, scratched and well used with some damage. Vince bracketed and bolted everything together and I waxed, waited 20 minutes and polished. I found these bedframes at a repurpose vintage, design store that was having a 60% off sale. In addition to these beds, I bought an awesome table that I use as my desk. I’ll show you the desk another day. The boy’s room needs curtains, which I’ve bought the fabric, just need to sew, sew, sew. 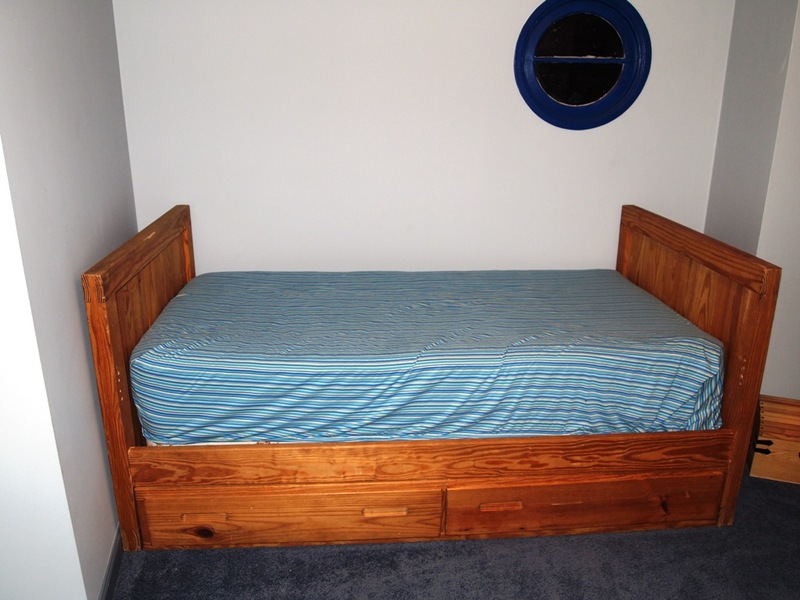 The other boys room is an odd-shaped room and we decided to find a captains bed for this space. For now, this room is the most complete. The walls photographed purple, but they are blue. This room is blue, blue, blue. 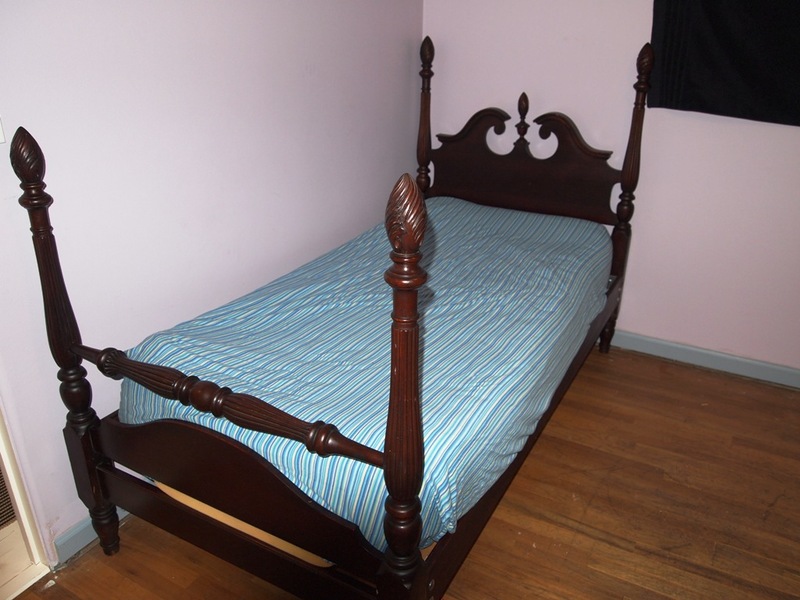 This bed is in great shape and was a $75 craigslist find. My office is the third room to be painted the first week of September. I will post photos when it is completed. Some of you have asked if we were settled yet. We have unpacked all of our boxes. Everything needing to be stored is stored, everything in use, is in use. We have a plan, and this time, I think we’ll get there. Our rooms aren’t “done”. When they are complete, I will post photos, I promise. Projects would get done sooner if we weren’t running to the river or lake every free moment. Summer is meant for outdoor fun. We will have all winter to work on these projects. One step at a time.